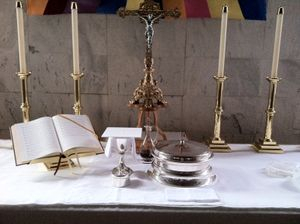 Our services follow the traditional liturgy. Holy Communion is served with both the common and individual cup. Christian Education is all year for all ages. They cast their crowns before the throne, saying, "Worthy are You, our Lord and God, to receive glory and honor and power, for You created all things, and by Your will they exist and were created." All evening services are at 7:00 p.m. Throughout the Church Year, we observe special seasons and days. Two such seasons are Advent (December) and Lent (Spring) when we have Midweek Services on Wednesday evenings. Special days include Christmas Eve, Christmas Day (10:30 a.m.) and New Year's Eve, Ash Wednesday (12:30 p.m. and evening service with the Imposition of Ashes), Holy Week (with services on the evenings of Maundy Thursday, Good Friday and Holy Saturday), Easter Sunrise Divine Service (6:30 a.m.) and Easter Day Divine Service (10:30 a.m.), Ascension of Our Lord (40 days after Easter, always on a Thursday evening), Thanksgiving Eve, and All Saints' Day (November 1, evening). Consider joining us for these special celebrations to hear God's Word and to receive His gracious gifts. Grace Evangelical Lutheran Church practices closed communion. This means that confirmed members of Grace and of our sister congregations in The Lutheran Church - Missouri Synod are welcomed to commune. We do not wish to insult or offend other Christians by not communing them, and we respectfully ask our guests to honor our practice and not commune. We simply want to remain faithful to God's Word. Wednesdays, 6:00 p.m. - 7:00 p.m., or by appointment. "Whereas consciences become burdened by sin, and whereas one may not fully recognize God's forgiveness, the pastor can speak God's saving Word directly to each individual."